Cravendale sponsorship of the upcoming The Muppets movie, due for UK release on 10th February 2012 is being promoted in an advertising campaign centred around a social giveaway of hundreds of thousands of unique, limited edition Muppets stickers designed specifically for two-litre Cravendale bottles. Cravendale consumers and Muppets fans will be able to collect the entire set of the stickers, with one character released each week from 9th January, beginning with Kermit the Frog. 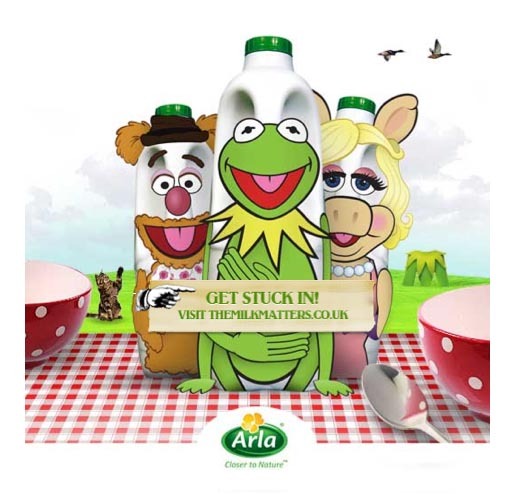 Anyone interested in taking part can visit a dedicated Muppets page on the Cravendale website, TheMilkMatters.co.uk, and register for the limited edition stickers (while stocks last!). Once fans receive their stickers they can upload a photo of their new creation to a dedicated Facebook app, The Muppets Makeover, which creates a short, personalised film that captures different Muppets characters interacting with the submitted photo. Each photo submitted to the Muppet Makeover will automatically be entered into a prize draw to win a VIP screening of the Muppets movie for 4 friends. The Cravendale Muppets campaign was announced to the loyal Cravendale community on 6th January alongside dedicated PPC, influencer outreach and Facebook ads. 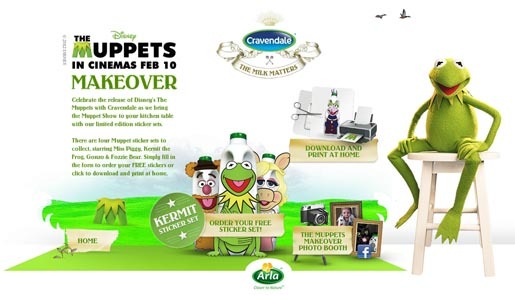 All promotional activity aims to drive users to enter the Cravendale community and engage with fans through the Muppet Makeover Booth, spot polls, further Muppet sticker characters and goodie bags. Facebook is being used as the campaign’s primary platform because it provides access to nostalgic parents who want to share Muppet memories with their children. The Muppets Cravendale stickers campaign will last for four weeks before a national on-pack promotion invivtes consumers to accumulate on-pack voucher codes to redeem against a Kermit the Frog back-pack. 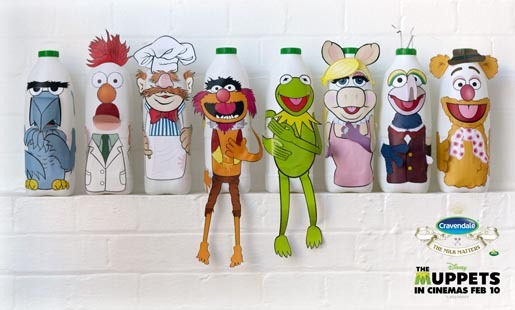 The Cravendale Muppets campaign was developed at Outside Line, London.